I've posted these before, but it has been a very long time since the last one. 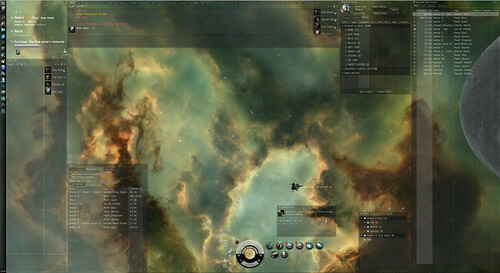 This is my main screen set-up for Eve right now. This monitor is currently running at 2560 x 1440, I can get higher but I find the text gets to small and I like this size the best right now. I just spent the last week trimming bookmarks from around 10,000 down to 2,500, amazing how much garbage was in there, or ancient Jump Bridge Networks that no longer exist from 4-5 years ago! lolz. Several of those windows are expanded in that view, the Peoples & Places window is normally not that big. And several of my more important chat windows are closed in this view. I have targets set to pop up right above the Selected Items window so that everything I need in a fight is together in the bottom right area. Also Fleet Windows appear above the Scanner window.